One Move, Plenty of Muscle. One of the best functional moves in my opinion is the turkish get up. The amount of muscle fibers and muscle groups that you hit with this one exercise is enough reason for you to incorporate it in your program but more than that, it corrects a lot of imbalances that the body has. Just look at the working muscles on each phase. The video above is a great step by step illustration on how to do the get up. The first phase which is the half get up can be seen in the first movement which is heavy on the abdominal muscles as well the stability muscles surrounding the shoulders and arms. The second phase requires a lot of full body power to get to one knee, as well as a lot of stability in the entire posterior chain. The final phase when you stand up completely works your glutes and quads unilaterally which is great since you can work each side of the body separately. This fixes a lot of the lateral imbalances (left and right side) that the normal person has and will improve your balance, stability, strength and power. All in one move. 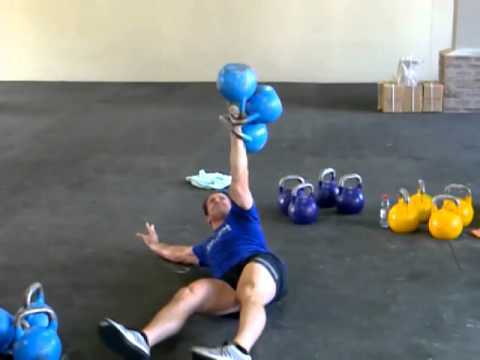 A lot of kettle bell aficionados will use the Turkish get up to improve on their craft. This is good, the only problem I see however, especially with beginners is that the kettle bells tend to hurt their forearms. I prefer dumb bells simply because it saves your forearm from the friction and pain which ultimately leads you to lift more. But as we can see with Coach Dos, you can use anything for this, yes, even a person.